This sounds like an easy question. But the answer, “A short story is a story that is short,” doesn’t tell us much. The truth is, writers and critics have argued for years about what is and isn’t a short story. But who cares? you might ask. What difference does it make whether we call this or that a short story as long as it’s enjoyable, right? Well, yeah, I agree; except, as a writer, I’d like to have some idea of what I’m aiming at when I’m writing short fiction–some standard of personal judgment that allows me to say, “This works well,” and I want to be able to explain to myself why this or that works well so I can write that way again. And as a reader, I’d like to be able to tell others why I recommend one short story over another; I’d like to be able to give them substantial reasons to consider my critical judgment. To support myself in both instances, then, I’d have to set up for myself a discriminating view of all short fiction in order to see where my work and my ideas fit into the scheme of things. In other words, to write short stories, and to read them well, I need a working definition of what these things are. There could be a lot more to say, of course, if you described the teacher, for instance, and told us something about his or her character. While you’re at it, you could describe yourself and your own background, telling us something about your other experiences with math, how you came to dislike it and when that dislike first surfaced. To dramatize the story you could show us what it was like being in that class you could put us there in your own seat, letting us see, hear, feel, and think the things you did. If you have done all of this, you have developed a fairly involved nonfiction story (an essay) about your experience with math last year. It is nonfiction because, we assume, you have been sticking to the facts, the observations and events that actually happened–those things that could be proven as “true,” at least according to your own perceptions. If you were to imagine events that did not happen and describe people as you would like them to be (say the teacher starts to look and act like a monster) and invest yourself with qualities you know you don’t possess (you become a wholly innocent, hard working student whom the teacher doesn’t understand), then your story would become a kind of tale, and you would be moving into the world of fiction, of make believe. Quite simply, a fiction is a lie, something feigned or made up. The word comes from fictio, the Latin word for “counterfeiting” or “disguising.” And fictio comes from fingere, which means “to make” or “to shape.” Story tellers have always been makers or shapers of characters and events. A tale refers in general to a false or exaggerated story: Your math teacher had fangs, you say? He carried a whip and made chalk float across the room? What a tale! You’ve no doubt heard of tall tales. These are fanciful narratives of great or wondrous characters and events. Tall tales are one kind of folktale. They are called “folk” because they are anonymous in origin and developed from repeated tellings among the folk or common people. Every country has its own folktales. The story of Paul Bunyan is an American folktale, as is the story of Johnny Appleseed. Short stories grew from tales in the 1800s. Whereas a tale is usually very short and action-oriented, a short story is more developed and often character-oriented. When you think of tales, think of stories of ghosts, horror, adventure, and fantasy. Their characters are often generalities or “types,” such as the good guy and the bad guy, who are secondary to the action–they serve to carry out the story line. When you think of short stories, think of everyday people dealing with such common problems as love, marriage, family differences, debt, success, loneliness, and so on. This is not to say that short stories can’t also be about ghosts and goblins. It is to say, rather, that even when they do deal with fantastic material, short stories pay more attention to the human experience than tales do: action is secondary to an examination of the characters. Generally speaking, in a tale, we’re along for a fast ride, a quick thrill. We don’t read ghost stories, say, to learn more about the human condition, for instance; we read them for pure entertainment. In a short story, we’re looking for more intellectual involvement: the interest of the short story is that it tells us something more about ourselves and others. That’s why in a short story we may say, “Yeah, I know exactly what the writer’s saying: I’ve experienced a similar problem, I’ve been in a similar situation.” This kind of identification with, or sympathy for, the character or the situation accounts for much of the short story’s appeal. Okay, time for a big qualification: I’m talking about “contemporary” short stories–those that have currency now among the mainstream literary readership. There are plenty of exceptions to everything I’m saying. The exceptions are not going to help us here–not if we’re trying to apprehend the contemporary literary standard. Once we understand the standard, and all that it privileges, then we can violate, mutate, or manipulate it to serve our purposes (if, say, our aim is is to be “experimental” or avant-garde). To define the “short story,” some traditionalists would point back to Edgar Allan Poe (1809-1849), who believed that a (short) story must achieve a “unity of effect,” which is to say that every element of the story contributes to a single mood or theme or intention the one “point” the story makes. Plot: the story line, the series of actions and events that move the story from beginning to end. It is what happens. Character: the actor or actors involved in the story. Narrator: the person or voice telling the story. Setting: the site or locale where the story occurs. Point of View: the perspective from which we see the story unfold. From whose eyes, whose head, do we see the story? Theme: the idea or message the story imparts. Theme is the product of the reader’s interpretation of the story: What does this story mean? Structure: the shape of the story, how it is built in terms of action (plot) and the sequence of time in which those actions occur. 2) rising action precipitated by some complication: the introduction of the conflict or problem, which sets the plot in motion and raises the question, How are the characters going to deal with the problem? 4) resolution or denouement: the “unraveling” or clarification of events, when the characters come to terms (but do not necessarily solve) their problems. There is, then, in the traditional short story, a clear sense of movement, from beginning to end, that makes readers feel they have gone somewhere, have been through something. Thus, when the story is done, readers feel that a circuit has been completed, that they have run a course of events, and now nothing else need be done or said: they feel that this end is the right place to stop. This does not mean that you won’t have questions or that a story won’t bother you; it means, simply, that the story seems to have achieved what it set out to do: it seems to have run its full and natural course. Most renown short stories feature some insight into the workings of the human heart and mind; these stories are often distinguished by psychological realism, accounting for the thoughts and motivations of characters in a realistic or plausible fashion. In other words, the characters don’t change overnight: they evolve, growing or changing through experience. In order to change a hateful man into a loving man in the course of a short story, for example, the writer would have to involve the man in some experiences, some interactions, that would help him change his ways. Since we readers know something about human nature, we can be fairly sure that a man who’s been hateful all of his life would not become loving simply because someone, say, opened a door for him or offered him a stick of gum. He would have to undergo a more profound experience; otherwise his change would seem forced by the writer. Psychological realism, then, is a matter of allowing the characters to act as it seems they should act within the context of the story. When characters act as though they are simply the author’s puppets, we say they are “out of character” and the story is poorly developed. Below is a list of the things I look at when I read student short stories. These elements constitute the fundamentals that all accomplished short story writers have mastered. I’ve listed them from the least difficult to the most difficult and have offered an explanation of each as a review of the strategies and techniques we’re learning. 1) Punctuation & Spelling: every published story you read is a resource for strategies of punctuation use. Strive to vary yours: make punctuation–colons, parentheses, dashes, etc.–work for you, to orchestrate the mood, the attitude, the pacing of your language. Remember, poor spelling and poor punctuation distract the reader from what you have to say and may suggest to others that you are indifferent to your craft. Things to avoid (unless orchestrated for effect): run-on sentences, unmarked clauses, overuse of punctuation (like exclamation points!!!!!!!!!!!! ), unmarked possessives (Bobs car)…. b) Consistency: do you stay with the tense you begin with? Usually, inexperienced writers shift tenses unintentionally–moving from present to past, past to present for no apparent reason–because they are writing too quickly and/or thinking only of the plot line (what happens next). c) Is your use of tense well orchestrated? If a story occurs in the past tense (I thought…. ), for instance, flashbacks from that point should be in the past-past tense (I had thought….). a) Orienting the reader: If the story belongs to a certain character, in other words, you’d do well to place us with that character as soon as possible. EXAMPLE: “Several times, when David comes home from the hospital to eat with his family, or calls Jenny to come quick and listen to Zanny pick out words in her bedtime book, or looks up at the bathroom mirror and sees Jenny behind him, in the bedroom, pulling on jeans and a sweater, he sees a difference in his wife’s face, some subtle but fundamental alteration, and he knows that she is remembering what has been done to her.” This first sentence of “Things Not Seen,” by Lynna Williams, places us firmly in David’s point of view, for it frames the story in terms of his experience: when he comes home, when he calls his wife, when sees her behind him, when he looks at her and sees a difference in his face–then he knows…. b) Stay faithful to the point of view you’ve started with. That is, stay with–inside–your character’s head. EXAMPLE (of what not to do): “When she saw Derek leave the room, Vicki felt her heart wither. She looked like she had just bitten into a raw onion.” Notice how the writer, in the second sentence, jumps from Vicki’s p.o.v. to look at her from the outside like a reporter. Usually when this happens, it suggests that the writer is avoiding the more challenging, more difficult, task of describing what the character is going through in his/her thoughts and feelings. c) If you are varying points of view–moving from one person to another–keep it consistent. Give each character equal time, otherwise your readers may find the switching from one head to another too disruptive. See Margaret Atwood’s story “True Trash” for an example. II) Control of Language: word choice (diction) and sentence orchestration. 1) Economy: Say the most with the fewest words: make your language as efficient as possible first by cutting down redundancies. “He shrugged his shoulders,” for instance, should be “He shrugged,” since you really can’t shrug anything else. 2) Word choice: Diction is a matter of choosing the best-suited word for the description you’re writing. This means that a) obviously it has to be the correct word: You wouldn’t write, “She was a doleful [sad] teammate” when you really mean “She was a droll [humorous] teammate.” If in doubt about the word you’ve chosen, you’d better look it up. b) A simple word often has a stronger impact than a fancy one: “He hated his father,” for instance, is far superior to “He hated his progenitor.” Latinate words are usually show-off words that draw more attention to the writer’s vocabulary than to the story he or she is trying to tell. 4) Active verbs are almost always superior to passive verbs because active verbs are more powerful: they more direct, demanding fewer words, which makes them less cumbersome. 5) Orchestrating sentences: you can make your sentences more efficient and more effective–make them “flow”–by a) cutting unnecessary information (again, being direct) and by b) combining sentences where possible. III) Audience Awareness: are you making your story accessible to your audience? Most stories–no matter how outlandish they may be–offer cues and clues that act as sign posts to guide their readers. They make reading easier and thus allow readers to enter the fictional world more fully. Work towards this awareness of what your readers need by studying how other writers make you comfortable with their fictional worlds. Remember, if more than one reader tells you that he/she is confused, your story probably needs more cues, clues, and clarifications. 3) dialogue tags tell us who is speaking (e.g., “he said”). a) historically: “He was listening to the war news on the family’s radio, a well-polished RCA as big as an icebox.” Listening to the radio instead of watching the TV suggests that this scene occurs before 1950. The mention of “icebox” instead of “refrigerator” is another clue. b) geographically: “Cyril used to grab at the Spanish moss that dangled from the limbs of the cypress behind his grandmother’s house, which stood on a weedy rise overlooking the bayou.” Spanish moss, cypress, and bayou all suggest that this story takes place in the south. c) cultural/social/political climate: “He sees her across the street–she’s wearing the latest fashion, something he’s seen only in magazines: ‘hot pants,’ an outfit that seems a hybrid of a mini skirt and culottes. When he calls to her, she turns abruptly, then flashes him two fingers held up in a ‘V.’ Peace. She’s grinning. He flashes her a ‘V’ in return, though he feels really out of it because he’s only recently started growing his sideburns and his hair, he thinks, is much too short.” The details about fashion–length of hair, length of skirts, and especially the mention of “hotpants” as something new–suggest the cultural climate of the late sixties or early seventies. relations with another: “He … looked at the bags [which belonged to him and his traveling companion] against the wall of the station. There were labels on them from all the hotels where they had spent nights.” This excerpt, from Hemingway’s “Hills Like White Elephants,” suggests–in the second sentence–that the man’s relationship with his traveling companion is limited to the nights they “spent” together. “Hotels” adds to this, hinting that theirs was mostly a sexual relationship. Edna and I had started down from Kalispell heading for Tampa-St.Pete, where I still had some friends from the old glory days who wouldn’t turn me in to the police. I had managed to scrape with the law in Kalispell over several bad checks–which is a prison crime in Montana. And I knew Edna was already looking at her cards and thinking about a move, since it wasn’t the first time I’d been in law scrapes in my life. She herself had already had her own troubles, losing her kids and keeping her ex-husband, Danny, from breaking in her house and stealing her things while she was at work, which was really why I had moved in the first place, that and needing to give my little daughter, Cheryl, a better shake in things. Richard Ford, the writer of this paragraph (the first in “Rock Springs”), plants a load of information to orient us to the speaker’s history: 1) he’s seen better times (“old glory days”); 2) he’s a good enough guy to have loyal friends (“who wouldn’t turn me in”); 3) he’s broken the law more than once (“it wasn’t the first time”) but apparently his crimes are fairly small (“bad checks”); 4) he’s good enough to have helped Edna, having moved in to protect her from her ex-husband; 5) he’s got a young daughter (Cheryl); and 6) he’s trying to be a decent father (“needing to give my little daughter…a better shake in things”). IV) Development: slowing down to show what’s most important. “Showing,” remember, is dramatizing while “telling” is summarizing. Every story has its share of both, and one is no less important than the other. Do not assume, then, that a summary doesn’t take as much skill to write as a scene does. The first paragraph of “Rock Springs,” for instance, (see example above) is an artful summary of the character’s recent past. a) Take time to show us a character’s thoughts and feelings, especially at critical moments. b) Details create a strong sense of place. c) “Stage directions”–descriptions of setting, movements, gestures and expressions–make a dialogue into a scene instead of simply a transcript of talk. He had his hand on the door knob, a cold globe of glass, an antique like so much of his mother’s house. Slowly, his hand still on the knob, he turned to her voice. She was standing at the doorway of the living room. Wearing her quilted robe, the one he had bought her for Christmas last year. Already it looked frayed, the red flowers now faded to pink. “You don’t want to keep your mother company?” She raised her finely-plucked brows the way he imagined an importuning child would look at a parent. 2) Character development is a matter of helping us understand why people in your story act as they do. Showing us the key character’s thoughts and feelings (see above, item “a”) is one of our primary strategies towards this end, as is showing us the details he/she sees (items “b” & “c”). Two other strategies are the use of d) flashbacks and e) “backfill”. When David saw the homeless man hunkered over the waste bin in the park, he recalled the day he found his uncle Stevenson picking through the neighbor’s garbage. It was Tuesday, trash day, and his uncle–whom he called Steve–was in well-pressed overalls made of indigo denim. “Did you lose something?” David asked him. Steve, his head well inside the plastic bin, raised a handful of crumpled newspaper in greeting. “I might lose a fortune if I don’t check out what McPherson’s throwing out.” It sounded as though he were speaking through his flannel shirt sleeve. “Does Mr. McPherson know you’re digging around in his garbage?” David edged closer to his uncle. He smelled the pungent stink of week-old tuna and rancid cheese. “Where’s the other one?” David asked. g) Consistency of character: although a fictional character must, ideally, be as complex as you or I–and consequently unpredictable to some degree–he/she must also be “consistent,” which is to say that within the context of the story you have made clear the realm of possibilities for this character’s behavior. Should your character step out of this “realm,” your readers will protest, charging that he/she is “out of character.” For example, say your character, Bob, is a dairy farmer who has a great affection for the many stray cats he cares for on his farm. We wouldn’t expect Bob to start shooting the cats at some point in the story unless you prepared us for this act by showing how Bob has grown so desperate and dejected that he feels cat-killing is necessary. On the other hand, we might expect him to shoot at a fox or even a stray dog if he thought it was threatening his cats. 3) Plot development is a matter of making the most of your story (i.e., what happens). A strong plot is one that shows movement or change. At its most elementary level, such movement may be literal, as in a story about an athlete running a race: we follow the runner from start to finish. A good story, of course, offers us more than a simple description of an event–it will offer us movement also on the emotional or the psychological level. Consequently, in our story about the athlete running a race, we may see the athlete’s expectations before the race, how these expectations relate to the rest of her life (i.e., What will winning the race mean to her? ), and the circumstances that define who she is and why she feels as she does. In other words, through her interactions with others, her memories (flashbacks), and her reactions to the current events, we receive not simply an account of a race but also a sense of this racer’s life. One of the hardest things to write about is a character in isolation (a prisoner in a cell, say, or a monk sitting on a mountain) because a character in isolation is static–he’s not going anywhere, he’s not interacting with anybody, he’s not doing anything except waiting, thinking, worrying. There’s little or no plot, in other words. Usually, when we come upon an isolated character in fiction either he’s insane, like the narrator of Edgar Alan Poe’s “Tell-Tale Heart,” or she’s eccentric, like the narrator of Eudora Welty’s “Why I Live at the P.O.” In either case, the isolation usually serves as the character’s excuse for telling us how he or she got to be so isolated. We’re taken out of the isolation, then, and placed into a story that promises to move us from some point in the past to the current point in the present. The narrator of “Tell-Tale Heart,” for instance, relates how he came to kill the old man he was working for and how, later, he gave himself away to the police. There’s plenty of physical, psychological, and emotional movement in this. Predictability: If a story is boring, chances are its plot is too predictable. This does not mean that, in order to keep your reader’s attention, you must impose all kinds of outlandish twists and turns upon your plot. On the contrary, impositions of this kind will also alienate your reader because they will feel artificial–too clearly your effort to fiddle with your fictional world. Remember that first and foremost unpredictability resides in the character you’re writing about, because he or she should be as idiosyncratic and varied as we ourselves are. When a character becomes too predictable, we consider him a type or, more specifically, a stereotype, like the nerd, the jock, the bimbo, etc. While many people in real life may share some attributes and inclinations of such types, few people are wholly predictable–that’s what makes life, and stories about life, interesting. One primary strategy for creating interesting situations is to undercut a reader’s expectations. For example, in a boy-meets-girl story, since we know what to expect, i.e., that the boy either will or won’t get the girl, the experienced writer knows not to make this the story’s focus. The writer may focus instead on the way the boy’s pursuit of the girl affects his relations with his brother, for instance. Not long ago, I wanted to write a story that started with this line, which I overheard while eating at a restaurant one night: “My greatest ambition in life fourteen years ago was to be a Dancing Boot, those long-legged girls who performed during half time at my high school football games.” However, as I began to write from this line, I discovered very quickly that a story about a girl who wants to be a Boot is fairly predictable. After all, either she gets to be a Boot or she doesn’t; and we’ve all read or heard of such stories. So I decided to let a man say these words. This turned the situation on its head and created a number of options for me to explore. 4) Thematic development: As I read a story, I ask, What ideas or issues is the writer working with? Is it evident that the story matters to the writer, that he/she is striving to work towards some understanding of the subject? Or is it clear that the writer is simply running the character through a maze of misfortune to see what happens? In other words, what is the point of the story? This is not to say that the story must have a lesson; it is to say, however, that the writer must give us a reason to read, not simply have us witness his/her lab experiment. Stories that bear re-reading are usually stories that offer something to think about–characters whose complexities we want to ponder, predicaments that speak to our own concerns, issues that resonate in our own lives. In Richard Ford’s “Rock Springs,” for instance, Ford is striving to understand how a decent man, Earl, becomes mired in misfortune of his own making. Earl’s hopes and dreams are neither unusual nor outlandish–he’s a regular guy, for the most part, with some irregular habits, like stealing cars. It is these habits, the way Earl has taken a detour in life, that make him interesting. But it is his earnest desire to hold his ragtag family together, to give his child a “decent shake” in life, to make his lover happy–these things make him like us and raise questions about love, honesty, and loyalty that most of us may ask of ourselves. Every text every book or story or piece of writing contains a speaker: When you read, there is always someone talking to you on paper. In fiction, the speaker in the text is called the narrator. He or she is the one telling (narrating) the story (the narrative). Of course usually there will be other people talking in the story too, but they won’t be talking to you, they’ll be talking to each other, so I call these people “actors”: they are like the actors in a play or movie we can see them but they can’t see us. Only the narrator knows we are here, watching and listening. The author is the writer who creates the story and the characters who act out that story. The narrator is the character who tells the story. 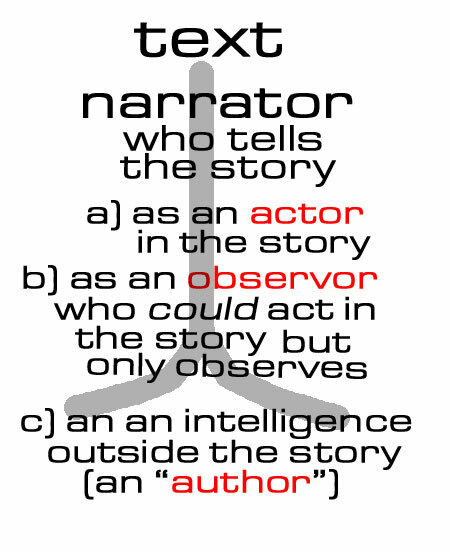 There are three basic kinds of narrators. 1) FIRST PERSON: the “I” or “we” perspective. Usually, this first person (“I” or “we”) narrator is telling his/her own story. This narrator is very limited in what she can tell us, since she can only speak from her own experience. You will see the first person singular (“I”) more often than the first person plural (“we”) simply because it’s more common to hear someone speaking for himself rather than for a group of people. 2) SECOND PERSON: the “you” perspective. You are not the kind of guy who would be at a place like this at this time of the morning. But here you are, and you cannot say that the terrain is entirely unfamiliar, although the details are fuzzy. You are at a nightclub talking to a girl with a shave head. The club is either Heartbreak or the Lizard Lounge. All might come clear if you could just slip into the bathroom and do a little more Bolivian Marching Powder. Then again, it might not. The main actor in the story is “you.” This creates a sense of universality, making it seem that the story could happen to anyone, since the “you” is open for any reader. Usually we hear the second person point of view in daily conversations: “Just when you think you’ve got everything done for the day, what happens? The boss hands you a pile of work and tells you to stay late.” We don’t often see this perspective used in entire stories, though it enjoyed some popularity in the 1980s when Jay McInerney’s Bright Lights, Big City (from which this example is taken) was a hit. 3) THIRD PERSON: the “he/she/it” or “they” perspective. a) the omniscient narrator knows everything about everybody–he/she is able to take us into any character’s mind to see what that character is thinking or feeling. This perspective is less common than the narrator of limited omniscience. b) the narrator of limited omniscience limits him/herself to knowing everything about only one or two characters. Most third-person narrators are of this type, and most limit themselves only to one character’s actor’s thought’s and feelings. If you are interested in having your narrator delve into more than one head, keep it consistent, giving equal time to each actor/character. c) the narrator who acts as author is a tricky creation because not only does he tell the story about someone else but he also refers to himself as the inventor of the characters and the actions described. Such a narrator became fairly common in the “postmodern” fiction or “metafiction” (fiction about fiction writing) of the past thirty years. They are sisters. I have brought two sisters to this invented island, and shall, in time, send them home again. I have dressed them and may well choose to undress them. I have given one three marriages, the other none at all, nor is that the end of my beneficence and cruelty. It might even be argued that I have invented their common parents. No, I have not. The bartender took several anxious looks in my direction. . . . I did not worry about his asking me to leave the establishment. I had created him, after all. I gave him a name: Harold Newcomb Wilbur. I awarded him the Silver Star, the Bronze Star, the Soldier’s Medal. . . . I put all his medals under his handkerchiefs in a dresser drawer. . . .
And [yet] he went on staring at me, even though I wanted to stop him. So I made the green telephone in the back of the bar ring. Harold Newcomb Wilbur answered it, but he kept his eyes on me. As the previous sections have suggested, before analyzing “voice” in fiction we must first determine where that voice is coming from: whose voice is it? because the speaker’s identity will help us characterize the voice we hear. The term “voice” refers to the projection of the narrator’s personality or character as he/she tells the story. Voice may reveal the speaker’s mood, how the speaker is feeling as he/she is talking: what emotions does the speaker convey? attitude, what stance the speaker takes toward his/her subject: does the speaker’s tone of voice betray irony, sarcasm, arrogance, humility. . . ? disposition, the speaker’s general inclination: is he/she “liberal,” say, or “conservative,” forgiving or unforgiving, warm or cold? education, how much and what kind of schooling the speaker has had? background, where the speaker comes from and what kind of experience he/she has had: is the speaker clearly from a particular place or region? Is he/she sophisticated, for example, or naive, citified or countrified? idiosyncrasies, the speaker’s unique mannerisms, expressions, and ways of thinking. By examining the speaker’s diction, phrasing, and punctuation, you can determine both the speaker’s style or way with words and the speaker’s tone of voice. A speaker who uses big words, long sentences, complicated phrasing, and no contractions may have a very formal, stilted style; and his voice may sound snobby or cold or school teacherly. A speaker who uses slang, a lot of contractions, simple phrasing, and a limited vocabulary may have a very informal, conversational style; and her voice may sound warm and friendly. Tone of voice has to do with the way the words sound, suggesting a certain attitude or stance: Is the speaker’s tone humorous, sarcastic, ironic, hateful, sentimental, poetic, preacherly, or. . . ? The style has to do with the way the word are put together to create this tone or attitude. Phrasing: How does the speaker put words together? Do the speaker’s words seem to flow together like poetry or are they awkwardly strung out, as if the speaker were having difficulty talking? The way words “hang together” may tell you something about the speaker’s mood. Look at the way the speaker uses sentences. Is the speaker long winded, going on and on, in a single sentence? Or does the speaker blurt things out in short sentences, sounding almost like a telegram. The combination or variation of sentences may reveal something about the speaker’s state of mind or character. No doubt I now grew very pale [upon hearing the beating sound]; but I talked more fluently and with a heightened voice. Yet the sound increased and what could I do? It was a low, dull, quick sound much such a sound as a watch makes when enveloped in cotton. I gasped for breath and yet the officers heard it not. I talked more quickly more vehemently; but the noise steadily increased. I arose and argued about trifles, in a high key and with violent gesticulations; but the noise steadily increased. Why would they not be gone? I paced the floor to and fro with heavy strides, as if excited to fury by the observations of the men but the noise steadily increased. Oh God! what could I do? I foamed I raved I swore! I swung the chair upon which I had been sitting, and grated it upon the [floor]boards, but the noise arose over all and continually increased. It grew louder louder louder! And still the men chatted pleasantly, and smiled. Was it possible they heard not? Almighty God! no, no! They heard! they suspected! they knew they were making a mockery of my horror! this I thought, and this I think. I felt that I must scream or die! and now again! hark! louder! louder! louder! You may want your character to speak oddly or “funny” on account of his/her background. In other words, you may want to use dialect. A dialect usually belongs to a group of people who are distinguished from those around them by geographic and/or socio-economic differences. This difference is often apparent both in the way they speak the language (pronunciation) and the way they use it (grammar). Do not be mislead: a difference in pronunciation and grammar does not constitute a difference in intellect. In fact, everybody has a dialect; it just so happens that the most widespread American dialect, called “Standard English,” has encouraged many speakers (especially school teachers) to discriminate against all the others. Shakey Bee bottom lip all swole up with Sweet Peach and me explainin how come the sweet-potato bread was a dollar-quarter this time stead of dollar regular and he say uh hunh he understand, then he break into thizzin kind of hum which is quiet, but fiercesome just the same, if you ain’t ready for it. Which I wasn’t.